Let's get one thing straight from the start - this Asian-Style salmon soup is a very light dish indeed. But the flavours are simply amazing, so fresh. I absolutely love it. I have a huge appetite. Sitting still makes me hungrier – not to mention sitting still and writing about food. I’m less hungry when on the go and never more so than when in the kitchen cooking up a storm. Cooking stills my hunger. I have personally never known a better way to lose weight than to cook a lot. I still taste all the food I cook, of course, but being in the middle of cooking one dish after the other reduces my hunger immensely. I’m not going to deny it though - to properly still my hunger on a very hungry day, I’d have to add more than one fillet of salmon to my own bowl of this Asian-Style salmon soup. I like to serve this Asian-style salmon soup together with a salad like my Asian-Style Carrot Salad, Crunchy Thai Salad or Asian Coleslaw. 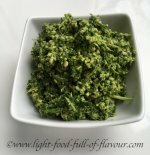 It is simply a case of matching Asian flavours in a main course with other Asian flavours in any side-dish that I serve at the same time. 1. Start by heating up the oven to 200C/fan 180C/400F/gas mark 6. Pour the stock into a sauce pan, add the sugar and bring to a simmer. Add the garlic, ginger, lemongrass, chilli and lime zest to the pan and simmer for 10 minutes. 2. While the soup is simmering, cover a baking tray with baking parchment. Place the salmon pieces on the tray, season with a bit of salt and cook in the oven for 5-6 minutes. 3. Add the fish sauce and the lime juice to the soup. 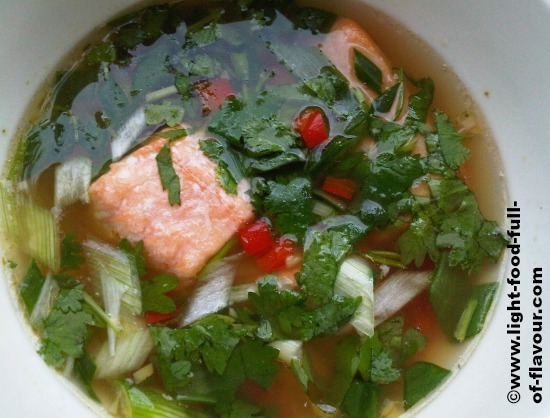 Place 3 pieces of salmon in each bowl, divide the soup between the bowls and scatter over the spring onion (scallion) and coriander (cilantro).